From a disciple of the late Chinua Achebe comes a masterful and universally acclaimed novel that is at once a taut, literary thriller and an indictment of greed's power to subsume all things, including the sacred. "Foreign Gods, Inc., " tells the story of Ike, a New York-based Nigerian cab driver who sets out to steal the statue of an ancient war deity from his home village and sell it to a New York gallery. Ike's plan is fueled by desperation. Despite a degree in economics from a major American college, his strong accent has barred him from the corporate world. Forced to eke out a living as a cab driver, he is unable to manage the emotional and material needs of a temperamental African American bride and a widowed mother demanding financial support. When he turns to gambling, his mounting losses compound his woes. A meditation on the dreams, promises and frustrations of the immigrant life in America; the nature and impact of religious conflicts; an examination of the ways in which modern culture creates or heightens infatuation with the "exotic," including the desire to own strange objects and hanker after ineffable illusions; and an exploration of the shifting nature of memory, "Foreign Gods" is a brilliant work of fiction that illuminates our globally interconnected world like no other. Okey Ndibe first came to the US to take up appointment as the founding editor of"African Commentary, "a magazine published by Nigerian novelist Chinua Achebe. He has been a visiting professor at Brown University, Connecticut College, Simon s Rock College, Trinity College, and the University of Lagos (as a Fulbright scholar). His award-winning journalism has appeared in"The New York Times," "The Guardian," and the"Hartford Courant," where he served on the editorial board. Ndibe is also the author of "Arrows of Rain," andearned his MFA and PhD from the University of Massachusetts at Amherst. Helives in West Hartford, CT, with his wife, Sheri, and their three children." 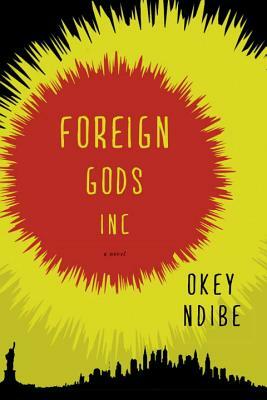 Praise for Foreign Gods, Inc.
"Razor-sharp... Mr. Ndibe invests his story with enough dark comedy to make Ngene an odoriferous presence in his own right, and certainly not the kind of polite exotic rarity that art collectors are used to... In Mr. Ndibe’s agile hands, he’s both a source of satire and an embodiment of pure terror." "A story of sweeping cultural insight and absurd comedy...rendered with a stoic power that moves the reader more than histrionics possibly could." "Unforgettable ... Ndibe seems to have a boundless ear for the lyrical turns of phrase of the working people of rural Nigeria... The wooden deity "has character, an audacious personality," says one non-African who sees it. So does Ndibe's novel, a page-turning allegory about the globalized world." "A hard look at the American dream, which seems to be receding further and further into the distance these days." "Captures the character of the intelligent yet deluded Ike, whose trip to Nigeria puts him face to face with the yawning need of nearly everyone he knows. And where there isn't need, there is greed." "A morality tale for our time... With subtle hints at moral turmoil, a gift for dark humour, and characterisation that is perceptive and neatly observed, Ndibe manages to persuade the reader to root for Ike, even as his haphazard plans begin to unravel." "Dazzling... It's already obvious that 2014 is going to be a big year for African novels...but Okey Ndibe is bound to set himself apart from the pack. Who doesn't want to read a novel about a good god heist?" "Bitter, sweet, pulpy, and rich in flavor, Okey Ndibe's second novel Foreign Gods, Inc. reads like the uncracked innards of a strange fruit. Each sentence a carefully crafted, holistic expression of Ndibe's eloquence, smacks of a master at work." "Brims with warmth, vibrancy and color... Just about perfect." "A New York novel, an everyman immigrant story, and a moving page-turner wrapped into one." "Okey Ndibe’s Foreign Gods, Inc is one of the most impressive African novels that I have read in years. Comic, sad—even tragic—Ndibe is a master craftsman, weaving his narrative with ethnic materials (and surprises) and a profundity that will startle you by the end of the story... Ikechukwu Uzondu’s journey into his past is as moving and frightful as Brutus Jones’ fate in Eugene O’Neill’s masterpiece, The Emperor Jones. Clearly, this is one writer to watch. Moreover, his insights into both America and Nigeria will take your breath away." "A freshly and heartbreakingly recast tale of American immigration, with all its longings, disappointments, effacements and reclamations." "This original [novel] is packed with darkly humorous reflections on Africa’s obsession with the West, and the West’s obsession with all things exotic." "A powerful novel... Foreign Gods, Inc. gives voice to the many talented people stranded, like Ike, between countries. All of us ought to be listening." "Foreign Gods, Inc. reads like the narrative of a taxi-driving Faust in modern Nigeria and America. With Moliere-like humorous debunking of religious hypocrisy and rancid materialism, it teems with characters and situations that make you laugh in order not to cry." "Foreign Gods, Inc. is a blistering exploration of the contemporary African immigrant experience in America. Ndibe tackles tough questions: from the shifting notions of home and identity to the nature of greed. In prose which is fresh and often funny, Ndibe draws the reader into the heartbreaking story of Ike Uzondu's attempt to survive in a world which seems determined to crush him." "The best-laid plans often go awry. But they can certainly make for an entertaining read." "Race, religion, greed, xenophobia—author Okey Ndibe tackles these sensitive topics and more in the heist novel to end all heist novels." "Ndibe writes of cultural clash in a moving way that makes Ike’s march toward disaster inexorable and ineffably sad." "Neither fable nor melodrama, nor what's crudely niched as "world literature," the novel traces the story of a painstakingly-crafted protagonist and his community caught up in the inescapable allure of success defined in Western terms." "A challenging romp of gods and styles." "If you’ve ever sat in the back of a cab silently – or not so silently – wondering where your cab driver is from and what his life is like (and really hasn’t everyone?) then you will be captivated by Nigerian writer Okey Ndibe’s new novel." "Unsuppressible, Okey Ndibe’s Foreign Gods, Inc. is a splendid work of art that belongs in every reader’s collection. In a masterful manner, Ndibe manages to blend the traditional belief of his Igbo ethnic group in Nigeria with the challenges that face many young and ambitious African immigrants in the USA. The social benefit of the book is immense." "Foreign Gods, Inc. leaves readers with this warning: be mindful about the powers you serve, and careful about the ones you seek to cross." "Ndibe writes with a folksy inclusiveness. The village humor, the greetings and teasing, lend the Utonki sequences a lyrical magic ... Into this richly stocked brew of characters, Ndibe skillfully introduces suspense in the final stretch, guiding readers through the tension of getting through customs Nigerian-style ... As an author with a foot in Nigeria and the U.S., he expertly brings both worlds to life. "Wonderfully colorful... There's more than a touch of Poe, or perhaps "The Twilight Zone," in the surreal conclusion of this story." "This is a heist story like no other.... Ndibe unfurls his rich narrative gradually, allowing room for plenty of character interaction while painting a revealing portrait of contemporary Nigeria. With piercing psychological insight and biting commentary on the challenges faced by immigrants, the novel is as full-blooded and fierce as the war deity who drives the story." "On the surface, Foreign Gods, Inc. is a heist book about a Nigerian cab driver in New York trying to steal an ancient statue from his village in Nigeria. But Okey Ndibe’s novel delivers far more than that description suggests, tackling everything from tradition to trying to make it in America, and the way Western countries view the rest of the world." "A close associate of the late, great Chinua Achebe, Okey Ndibe adds his voice to a new generation of writers ... Foreign Gods, Inc. features New York-based Nigerian Ike ... [whose] picaresque journey, gently but incisively told, shows us the vagaries of both American and Africa culture." "A landmark in a promising novelistic career." "Ndibe’s novel takes on serious themes of cultural exchange, but it does so in a decidedly comic fashion. All the characters Ike encounters, in New York and in Nigeria, inject their own brands of humor into the story." "A testament to Ndibe's talent and a reason to put him on the list of authors to keep on your radar."